What I love about all this stuff I’ve been doing is the feeling of exploration and freedom. It’s not anything a million Chamonix locals haven’t done before me, but just re-imagining the possibilities that open to you if you can ski, climb and run a little bit has been so much fun. It also allows you to experience Chamonix as a deserted mountain paradise when the hoards are taking the lifts. Being able to feel strong and self-sufficient in the mountains is one of my main motivations for getting fit. 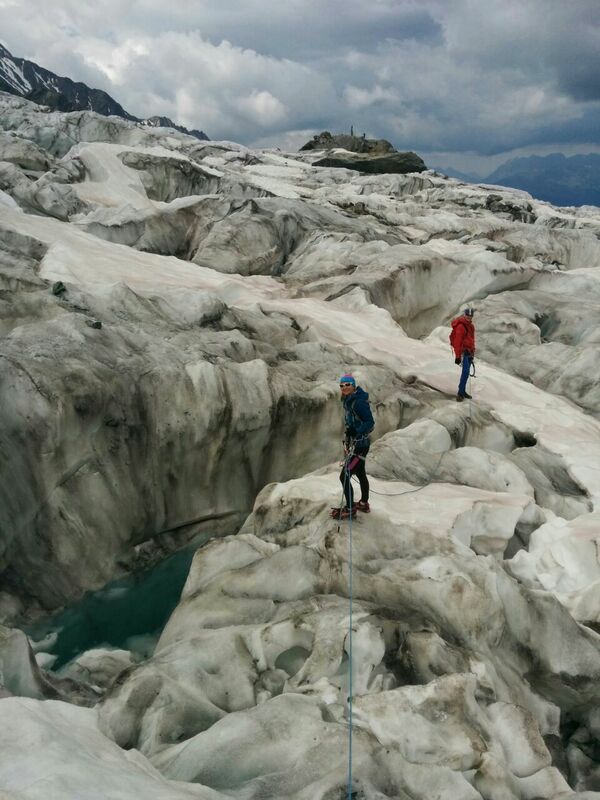 This is what I’ve been up to in Chamonix recently. If you have done similar stuff, I’d love to hear about it. Running from le Buet. I’d got lost almost instantly and spent an enjoyable 30 minutes scrambling around with the chamois, then crossing a stream. Getting lost is part of the process! So the next day I headed back at dawn with trainers on my feet and skis on my back. I felt very silly setting out from the car park with not a patch of snow in sight, but it was 6am so there wasn’t anyone to see. I marched up at high speed past the Chalets Loriaz and to the start of the snow. 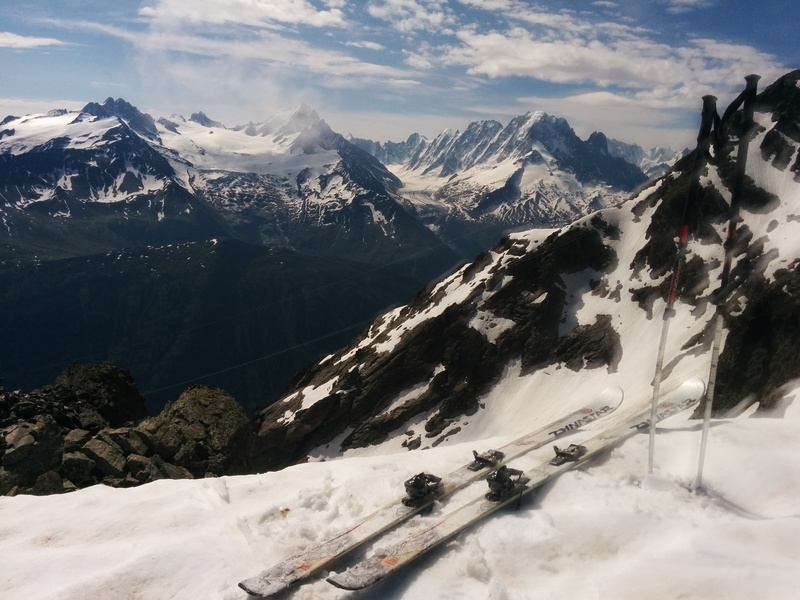 After swapping trainers for skis, I quickly discovered that skinning up a steep slope on this June snow – compact from so many freeze-thaw cycles but with a slippery melted snow layer on the top – was pretty difficult. So I switched to a tactic of putting my skis on my back whenever there was some solid ground to walk on (which was frequently). 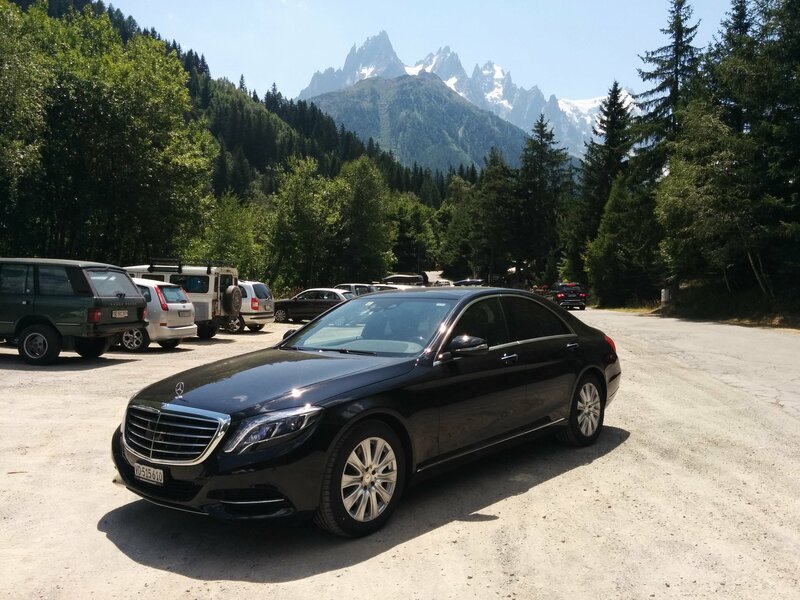 Over the top of Col de la Terrasse, I could see my objective – the Cheval Blanc. It’s an ill fitting name at that time of year, as I was attempting to ski a thin strip of snow down an otherwise black rocky peak. I skied down, and skinned up, and then went the wrong way. Being too close to the mountain I had gone too far right on a piece of snow and got stuck under a band of steep loose rock. I didn’t fancy scrambling up it on my own because I wasn’t sure how far I’d plummet if I fell! Time was marching on so rather than correct my error I just skied down (and up, and down again -this alpine running business involves a lot of transitions!). Once reunited with my trainers, I did run down to the car – but it was a bit tricky with my skis and boots strapped to my light bag. I didn’t achieve my objective. But I had a brilliant morning, covering lots of ground and generally feeling very pleased to be skiing the Aiguilles Rouges in June. The actual skiing was quite good too. About half my alpine climbing missions involve failure – if you define that as achieving the objective. This was no exception. Nico, Rachel, Emily and I decided to run from Les Bossons to la Jonction, which is the meeting point of the Bossons and Touconaz glaciers and has breathtaking views all the way up. I love this run and have raved about it before. Near the top Emily had a new innovation: not content with the “not-trail, not-running” pace we were moving at, she pushed the boundaries even further: the sport of “not-trail, standing” was born. Unfortunately for her my lack of patience prevented her from getting much practice. We had brought glacier stuff with us with the intention (read “hope”) of crossing the glacier to the old lift station. It’s very heavily crevassed up there, and there is an eerie creaking as the ice inches its way down the mountain. We made our way through the maze for a while before making the inevitable decision to turn round. By coincidence we saw three figures skiing down the face of Mont Blanc by the Mulet hut. Then we realised that they were running. It turned out that Kilian (a real alpine runner) and friends had just been out for a morning jolly. 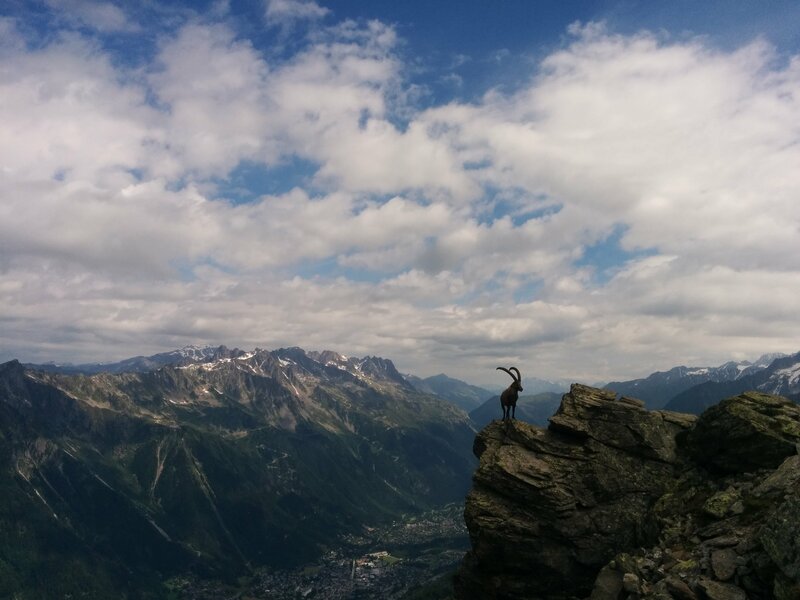 This is on Kilian’s list of things to do around Chamonix. I’d thought it was classified as “easy”, but I’ve just looked it up and its “moderate”, AD-. No wonder it was a bit nerve-wracking! I arrived in Chamonix on Friday night and walked up to my bedroom in the dark: the Mer de Glace view point above Lavencher village. What a view to wake up to! It was invisible when I arrived in the middle of the night, although I did fall asleep watching the shooting stars above. Having admired the view, eaten an avocado and a peach (all the carbs I can eat when I don’t take insulin), I was ready to leave. Being half asleep still, my body was finding it quite hard to stay upright – I hoped things would improve when I actually hit the ridge. My route followed a ridge all the way up to the top of the Bochard bubble lift. You can continue further up to the Petite Aiguille Vert, but I didn’t have any glacier equipment so it wasn’t an option for me. One for another time. I did have some cord, a harness, some slings, a sleeping bag and a bottle of beer, so I was ready and equipped to sleep anywhere if I got tired! You follow the path in the direction of the flat area below Lavencher Bowl, but when it starts going down, you just follow vague animal tracks up. It’s so much fun picking your way through rhododendrons and over rocks. I find that the muscles don’t feel so tired when the ground is so interesting. After a bit of a warm up on the tree covered ridge near the bottom, ending at the entrance to the Chapeau couloir which is a skiing classic, the going gets steeper. I enjoyed the nice friendly flowers before being intimidated by the thin air beneath my feet higher up. It’s pretty steep going up more animal tracks, and whilst it’s not technical, there is definitely a feeling of exposure! The ridge is then totally knife edge. And with huge drops either side it definitely had the airy feel I’d wanted from “alpine running”. 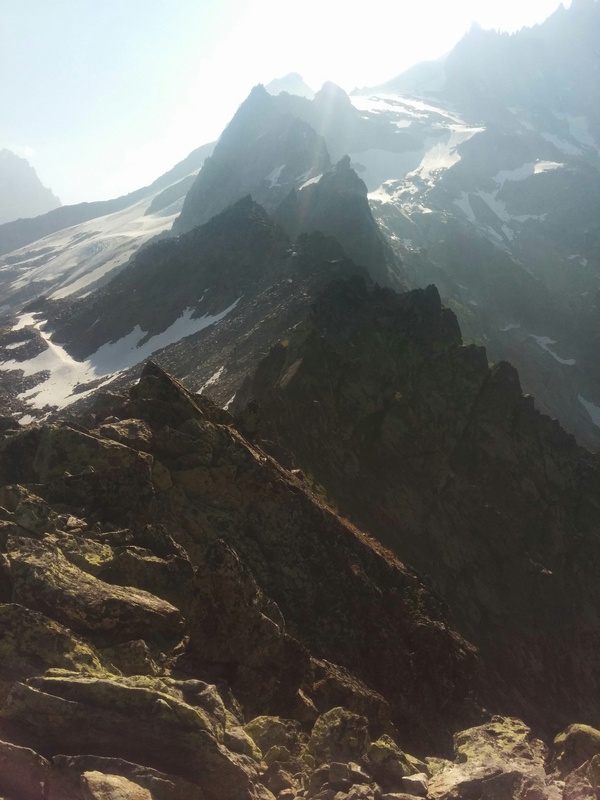 I’d love to see Kilian run it: at one point I spent about five minutes peering down each side of the ridge, assessing the lesser of the two evils: retreat down the animal tracks or do a few easy but exposed climbing moves. (Having practised “not-trail standing” with Emily, I can report that I excelled at this moment of indecision.) I went for the climbing moves and luckily things got a bit easier from then on. I was actually pretty thankful to be wearing these new Salamon X-alp shoe/boot things. You can just about run in them, but they are good for climbing too. It was the first time I’d worn them and my confidence in the shoes and on my own ability to balance increased as the route wore on. 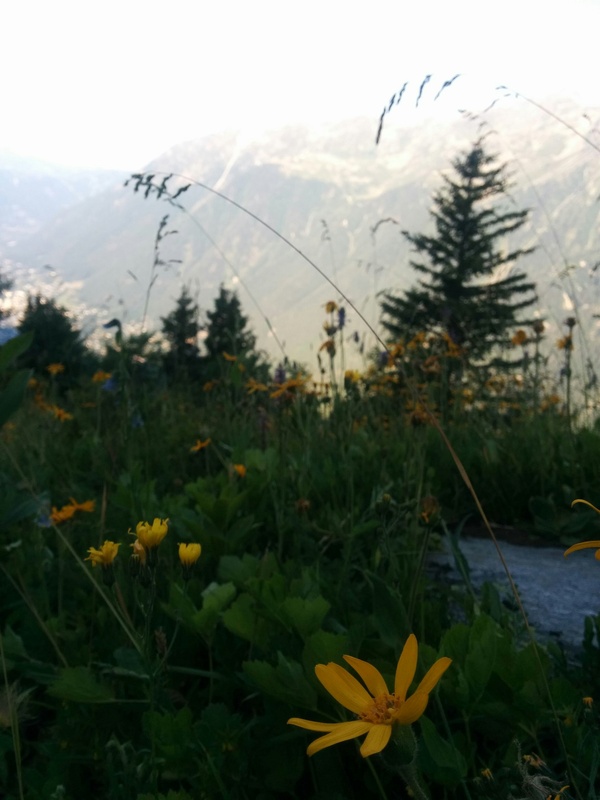 Having achieved my objective for a change, I could enjoy the view and some food before running back down to midstation of the Grands Montets ski area. The run down was awesome: glissading on snow, hoping over rocks, running through meadows, followed by a steep descent of a dry stream. 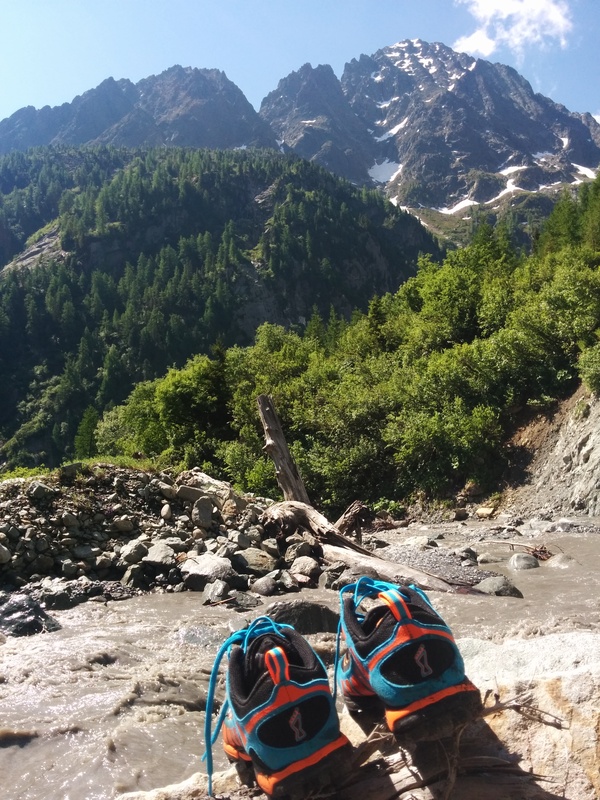 Minimal trail, changing terrain, a climbing move – can I call myself an alpine runner now?! Not much to report. Because spending time in the mountains requires you to make decisions constantly to stay safe, managing blood sugar just merges into all the other decisions I make. So I don’t often remember anything about my blood sugar after the event. On the Jonction trip, I realised afterwards that I’d forgotten to take my Lantus – the long acting background insulin – the night before. That wasn’t dangerous, it just meant that the activity didn’t reduce my blood sugar and so I couldn’t eat. The others were all happy munching away on various snacks whilst I made do with two fig rolls and a small snack bar (30g carbs in total) during the six hour trip. For a diabetic, the good thing about exercising all day is that insulin sensitivity is greatly increased. So whilst normally avoiding desert, after going to la jonction, I could hit the desert buffet seriously hard without my blood sugar going outside its normal range. Wahoo! When doing any exercise that is the aerobic equivalent of going for a run, I don’t take any fast acting insulin three hours before the activity. So when I am active all day, I just eat the carbs I need to top up my blood sugar as it falls due to the exercise. Before doing the Bochard ridge, I had a short climb up to my bivvy stop after dinner. I thought it had been ages – certainly more than three hours – since I’d taken the insulin. But my blood sugar dropped pretty quickly after I started out. Because I’m careful about exercise and hypos, I rarely have them whilst exercising, but luckily I am aware when I do. So it’s no big deal – I had jelly babies in my pocket so I ate some. If I need to hire a car I always go for the cheapest option. I don’t know whether I looked smart or trustworthy at Geneva airport the other day, but the hire car bloke upgraded me from my “Ford Ka or something similar” to a $95k Mercedes S-Class with just 2km on the clock! It was amazing. It could almost drive itself down the motorway it was so clever, and my head was pinned to the headrest when I put my foot to the floor. I’ve never driven a car like that so hadn’t experienced turning so many heads. In Chamonix it stuck out like a sore thumb, especially as the driver had been living a kind of feral life sleeping rough for the weekend.